MHC 2019 Bus Tours Announced! Dead Rising Haunted House is an old school, in-your-face haunt. They build all of their own props and sets for a uniquely terrifying experience. Midnight Terror Haunted House is a company with 20 years experience in the haunted house & entertainment industries. Driven by passion, MTHH has discovered what it takes to create something completely original, using “old school” tactics with a balance of “new school” technology, and extreme focus on making Midnight Terror an “actor driven” show! Midnight Terror’s expansive playground progresses throughout 26,000 square feet, more rooms than they can count, and actors in every spot they can fit. Explore the twists, turns, and tight spaces of “Factory of Malum”, which leads into the theatrics and special effects of “Black Oak Grove”. To finish off the Night Fear, you’ll then have to tread through “Chainsaw Alley”, an ending you won’t see coming! Work up your nerves and step into one of the scariest attractions in the Midwest, The Massacre Haunted House and Fear Freakshow 3D Haunted House. Newly renovated every year and ready to deliver the scares, The Massacre offers over 20,000+ sq. ft. of sheer nightmares for your enjoyment. This custom built haunted house allows visitors to walk through in small groups of six to seven and is designed to give mature audiences the scare of their lives! Focusing on fear and fright, this haunted labyrinth dishes up over 60 rooms of pure terror where over 100 ghastly clad actors are waiting to scare and delight. Frightening mazes, eerie animatronics and beyond are ready to fill your night with chills and thrills. Basement of the Dead haunted house has been top rated by BuzzFeed, HauntedHouseChicago.com, Hauntworld.com, the Chicago Tribune & more! Hidden deep in the woods and across the cemetery, HellsGate is a multi-level mansion filled with secret passages, giant slides, undead abominations, really nervous groundskeepers and a darkness that the gate can no longer contain! This is not just a haunted house, it’s an adventure! Since you were a kid, you’ve heard about the haunted house with the giant slide, the one hidden out in the woods, the one where you can win your money back, but you were never able to find it… until now! In 2016, Zombie Army Productions reopened the legendary HellsGate Haunted House. 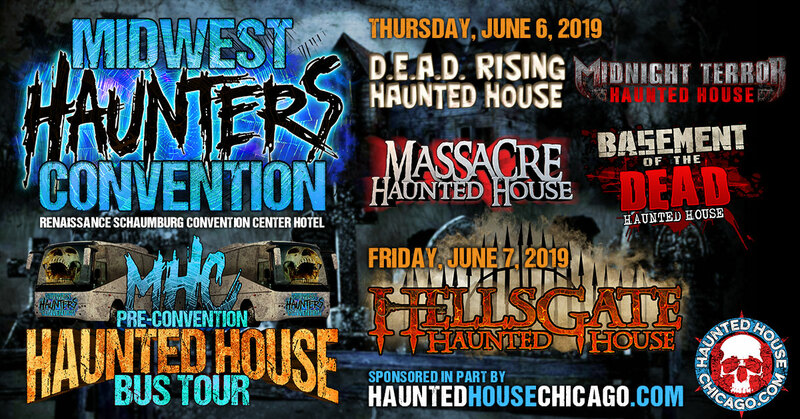 This June, Zombie Army is thrilled to welcome Midwest Haunters Convention to be the first off-season tour at the Zombie Army’s flagship attraction. With over 150 actors, haunted forest, outdoor cemetery and over 30 rooms inside the mansion, HellsGate is an active experience that you should not miss! Also, we will have music, bonfires, drinks, snacks and shenanigans after the show! Come for the great show, stay to party with the Zombie Army!